Prep your jars/lids. Slice an shallow X into the stem side of each grape. Evenly divide the spices and grapes between 2 pint jars. Combine the water, vinegar and sugar in a saucepan and bring to a low boil. Stir to dissolve the sugar. Pour brine over the grapes, leaving 1/2 inch of headspace. Remove any bubbles. Seal and process in a water bath for 10 minutes. 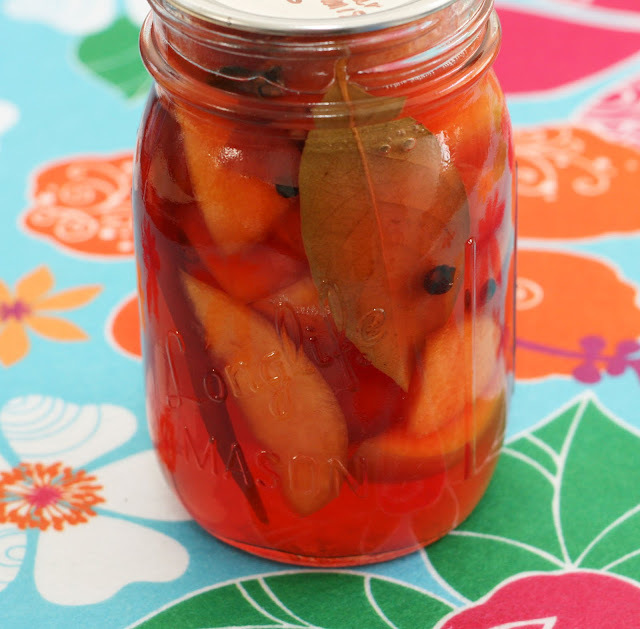 I love pickled fruit and this year I've been even more into pickling fruit then ever before. Jam and jelly takes so much fruit to make even a small batch and it seems like every weekend this summer has either been fully booked, 100 degrees or raining. Which means we haven't been hitting the pick-your-own farms or even the farmers market the way we have in the past. Pickled fruit however, in addition to being tasty, is much easier to make in small and even very small batches making it an easier and cheaper project than jam/jelly. What I like to do is make a few small batches of different fruit and flavors at once so I can get the most out of heating up that enormous pot of water. This particular pickles have a heavy herbal note thanks to the fresh ginger, bay leaves and rosemary. Bring the water, vinegar and salt to a boil. Prep the lids/jars. Evenly divide all of the spices and peppers between 3 pint jars. Add the squash, leaving 1/4 inch headroom. Pour in the vinegar mixture, still leaving that 1/4 inch headroom. Close the jars and process for 10 minutes in a hot water bath. Allow to sit 1 week before eating. I've talked before about our apparent yellow squash thumb. Our squash has been doing so well, I added a crookneck squash tag to the blog. We only have the two plants so we aren't as overloaded as we could be (no dropping off baskets of squash on neighbor's steps in the middle of the night) but we are still averaging a good number of squash a week. I was looking at the stash on the counter and with my crack canner's eye noticed that the circumference was just about that of a canning jar. I made zucchini pickles before so why not crookneck? Why not indeed. It took just a couple of minutes to slice the squash, pop it in the jars (I slightly bent a couple to really wedge them in) with some spices and then they joined some pickle friends in a quick trip in the water bath. Our crookneck squash has been really sweet so thought some orange notes and a touch of sugar would be good but since I am not a fan of really sweet pickles (even my fruit pickles are pretty savory) I slid a jalapeno in for a bit of heat. Try them on hamburgers! Not only are they a tasty alternative to the also delish classic pickled cucumber, they are the perfect size. Bring the water, vinegar and salt to a boil. Prep the lids/jars. Evenly divide all of the spices, peppers and garlic between 4 wide mouth pint jars. Add the cauliflower, packing it down and leaving 1/4 inch headroom. Note: If you'd rather not process these pickles, you can make these into "refrigerator" pickles. Just let them come to room temperature and keep all of the jars in the refrigerator. 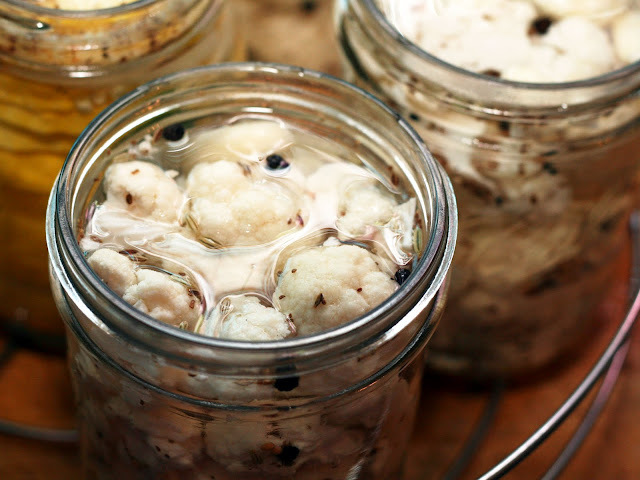 I always find cauliflower to be oddly expensive so when some went to sale recently, I thought I'd finally do something I've been thinking about for a while: make cauliflower pickles! 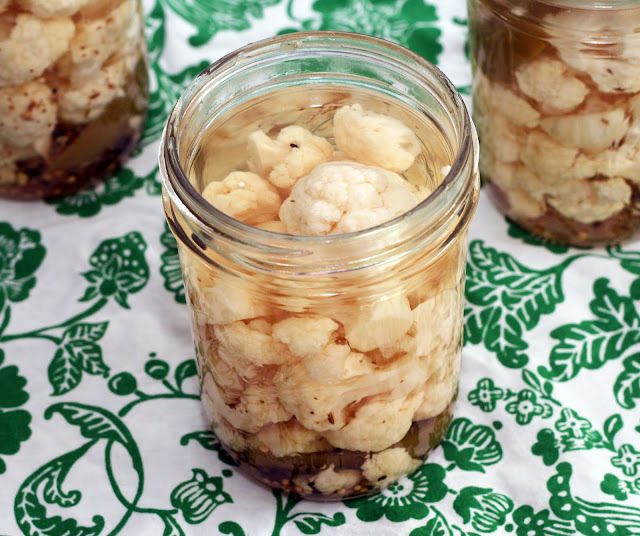 I am of course, a huge fan of anything pickled and while I've mostly had pickled cauliflower as part of a larger pickled dish like giardiniera, I thought they'd be fun to pickle on their own. I can just picture a pickle plate with these pretty white pickles, some dill pickled garlic, Old Bay zucchini pickles, hot pepper pickled asparagus and smokin' hot pickled okra. I also really enjoyed these with a wedge of really sharp cheddar as a late night snack. One unexpected thing about these pickles is that after I took them out of the pot, there was a lot of "float"; the cauliflower was above about 2 inches of brine. The next morning however, they were as they are pictured there, evenly distributed in the brine just like they were before processing. I haven't had this happen before but I like it! The pickles would taste the same either way but the jars look prettier with the cauliflower spread out. Prep your jars/lids. Pierce each grape with a fork*. Evenly divide the spices and grapes between 4 pint jars. Combine the water, vinegar and sugar in a saucepan and bring to a low boil. Stir to dissolve the sugar. Pour brine over the grapes, leaving 1/2 inch of headspace. Remove any bubbles. Seal and process in a water bath for 10 minutes. *I actually used a two pronged cocktail spear. I saw these beautiful Black Beauty grapes at the grocery store and had to have them! 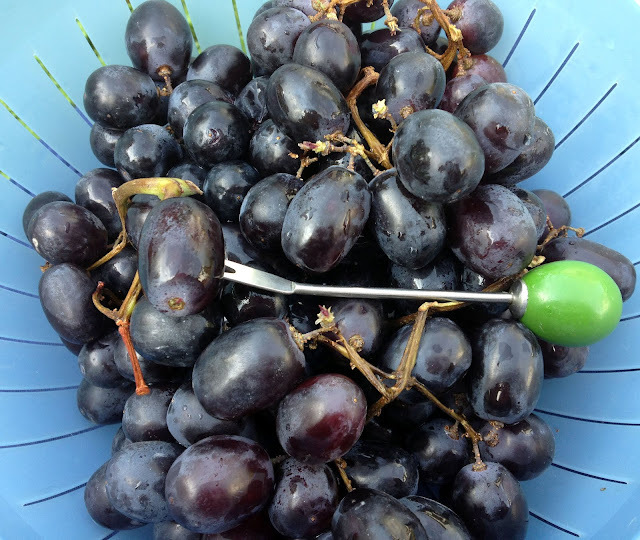 I didn't know exactly what type of grape "Black Beauty" was but when I looked it up it turned out it is a type of muscadine, which are a popular variety of grape in the South. Seedless, dark purple and pretty large; I thought they'd be perfect for pickling. Luckily, I was right! I pierced the slightly tough skin to ensure that the pickling liquid really penetrated. 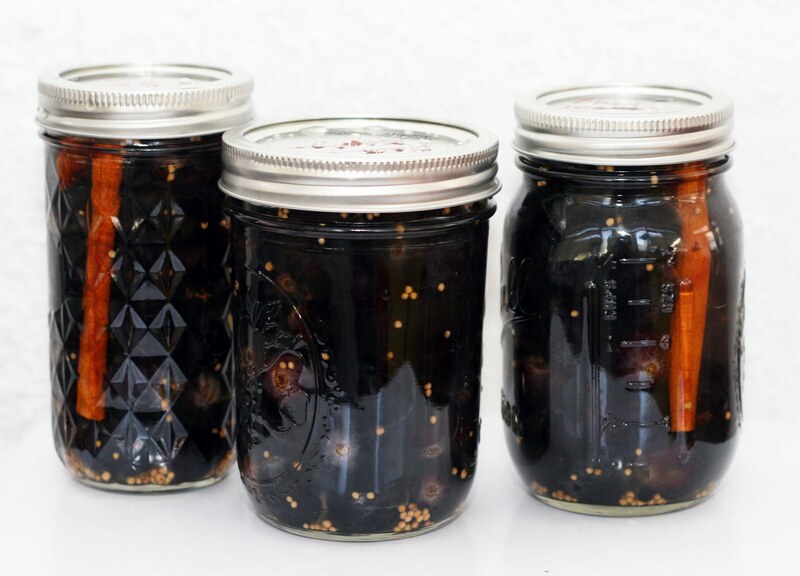 Since the grapes were on the sweet side, I really stepped up the spices with this recipe: whole cloves, cinnamon sticks, star anise and vanilla beans really pack a punch! Try these grapes on their own, in a drink or part of a cheese plate. Note: For best flavor, let these pickles sit one week before eating. Also, as with most pickles, if you do not want to process them to be shelf stable, you can let them come to room temperature and then refrigerate them. Prepare the dough according to the instructions in the dough recipe. Prepare the Holy Trinity Pizza Sauce. 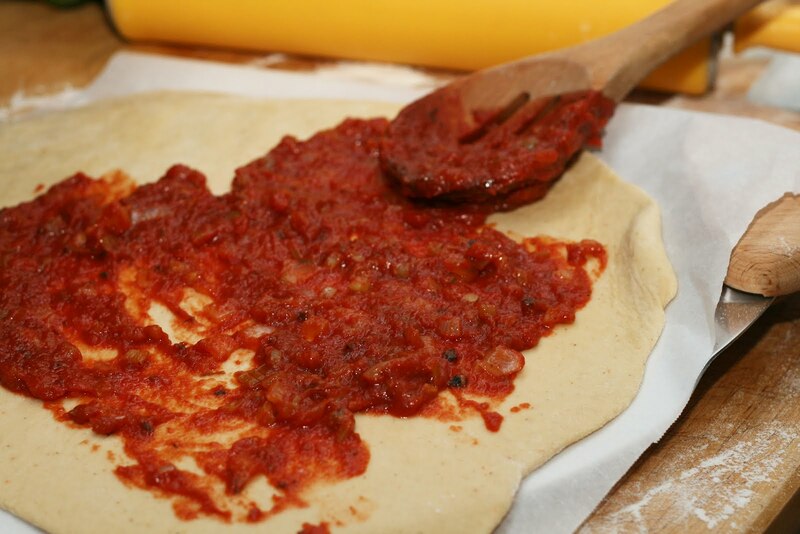 Once the dough is ready, spread about 1/3 cup of sauce on each pizza. Sprinkle both pizzas with 90% of the cheese. Evenly divide and distribute the toppings. Sprinkle with the remaining cheese (this helps keep the toppings from shifting when you take the pizza out of the oven) then sprinkle with Creole seasoning. Place on the preheated pizza stone and bake for 12-15 minutes or until the crust is lightly browned and the cheese is melted. Slice and serve immediately. My local grocery store keeps getting in slightly unusual seafood lately: different kinds of fish, squid, these crawfish (crayfish) and I keep buying it because 1. I like variety and 2. I'd like them to keep stocking unusual seafood so I want to make sure someone is buying it. So then I had to come up with a crawfish recipe on the the spur of the moment. There is a pizza place near where we live that also makes po'boys and other NOLA inspired foods. They don't have any Creole or Cajun inspired pizzas but that always seemed like a mistake to me. Since I had the crawfish I thought I'd make my own pizza, one I wish they'd make. Obvously I needed andouille but the store didn't have links, just the mini cocktail sized andouille so I bought that. It actually ended up being pretty cute on the pizza. I love when making do turns out for the best after all. In a large saucepan, saute the onions, celery, pepper and garlic, in olive oil, 3-5 minutes or until fragrant. Add tomatoes and spices and stir. Cook 30-40 minutes on low or until thickened to the point when you run a spoon across the bottom of the pan "parting" the sauce and virtually no liquid trickles into the middle. In Lousiana, onions, peppers and celery are called the holy trinity because they form the base of many local dishes like gumbo, étouffée, dirty rice and jambalaya. Bell peppers are commonly used but I prefer the bite of cubanelles. Just take care to finely dice everything or you will end up with a lumpy pizza. 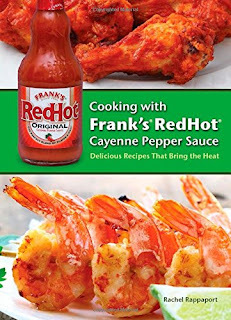 Try it with my crawfish & andouille pizza. Pour warm water into the bottom of a stand mixer. Add sugar and yeast. Stir the mixture until the yeast is dissolved. Stir in the Creole seasoning, olive oil and salt. Add the flour. Meanwhile, preheat the oven to 475. Place 16-inch (or larger) pizza stone on lowest shelf position. 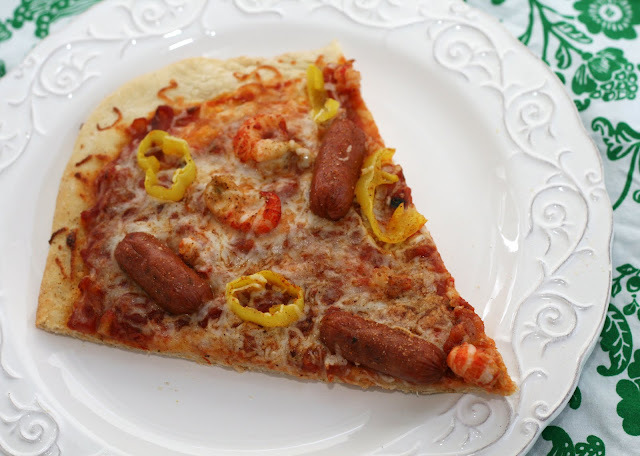 I wanted a lightly spiced dough to go with my exciting crawfish pizza but I think this dough would work well with any pizza that needs a little zip. It is an awesome dough to work with as well, it rolls out like a dream and doesn't tear when you stretch it. Prepare grill according to manufacturers instructions. 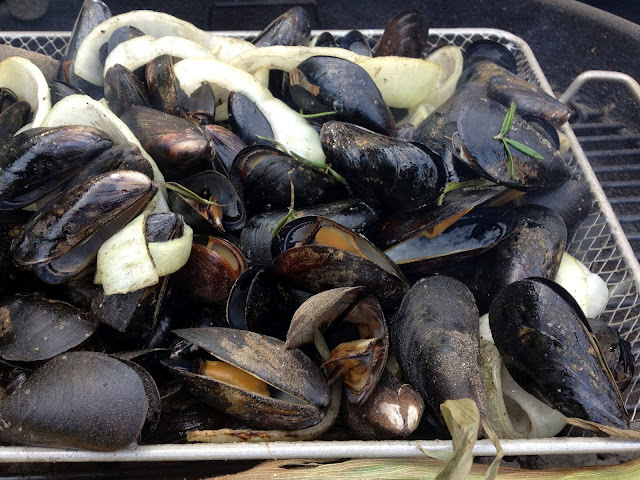 Toss the mussels, onion, rosemary, salt and pepper together. Drizzle with canola oil, toss again. Pour into grill pan. Place on grill. Cover and grill 5-10 minutes or until the mussels are all opened. Meanwhile, in a small pot, place the butter, vinegar and rosemary. Melt over low heat. Whisk together. Serve with hot mussels. The picture above is from my iPhone. Not bad, huh? My camera battery died just as the mussels were done so I had to improvise! I didn't have time to charge my battery, it was dinner time! I have made mussels many times but never on the grill. I was doing some canning (fruit pickles!) and was running out of burners and the house was hot so I thought I'd try them out on the grill. I had just bought this mesh grill roasting pan (similar to this one) at an end-of-season sale (is it really the end of summer already? I plan on celebrating summer until the actual end, in September) and it seemed perfect for the mussels. You could grill them directly on the grill grate but I have to say, it is easier to get them off of the grill when they are in a basket. The final product is awesome. Smoky, rich and full of the sea. 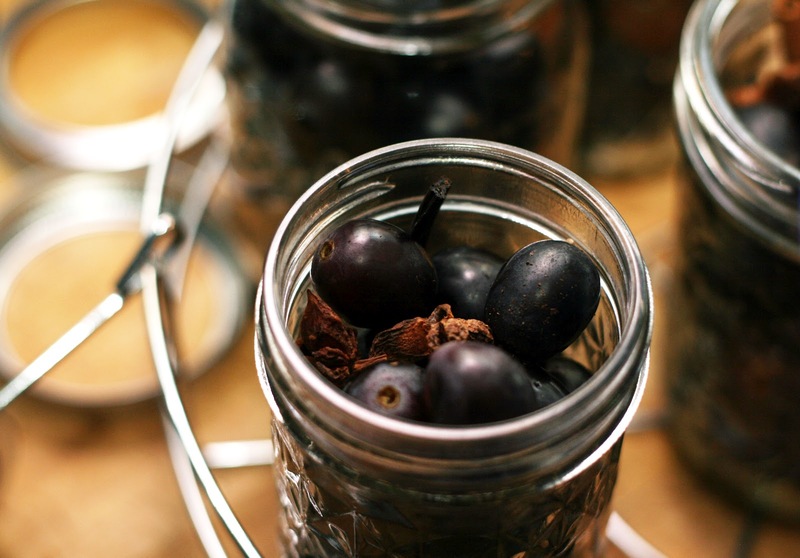 Add the plums and spices to a quart jar, taking care to leave a little more than 1/2 inch of headspace at the top. Combine the water, vinegar and sugar in a saucepan and bring to a low boil. Stir to dissolve the sugar. Pour brine over the plums, leaving 1/2 inch of headspace. Remove any bubbles. Seal and process in a water bath for 10 minutes. 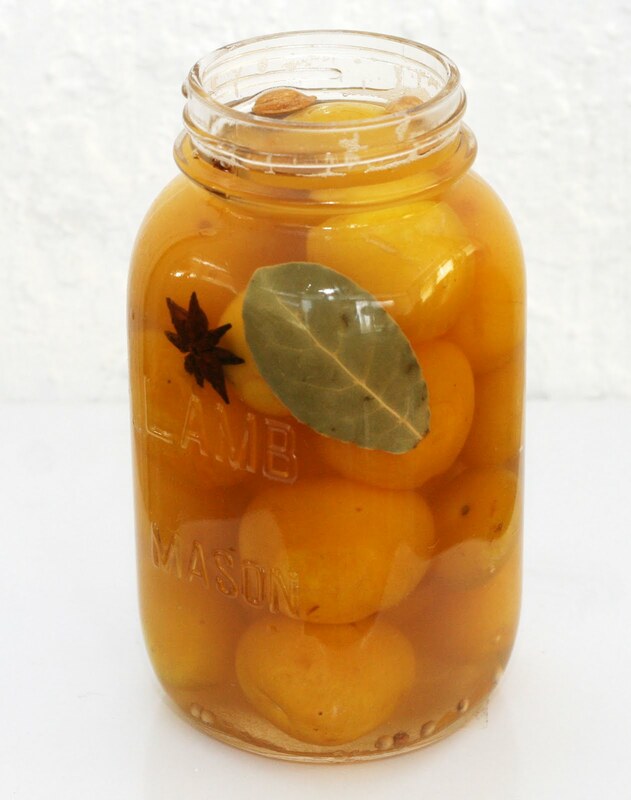 I had some mirabelle plums leftover after making jam and eating some out of hand so I thought I'd try pickling some. 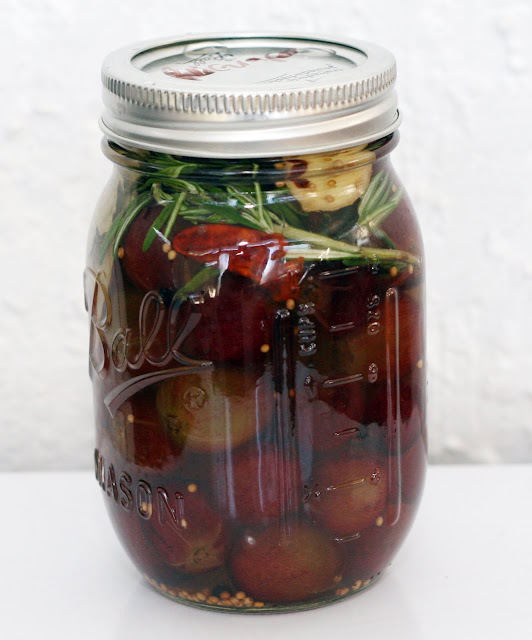 I love pickled fruit and hadn't had a chance to pickle plums before. I thought their small size, sweet flesh and tart skin would be great in a pickle. I was right! These pickles are sweet, puckery and intensely flavored. Although the plum are French specialty, the spices I used are a slight nod to Scandinavian cooking. They are just so aromatic, I knew they'd be a great fit. Since I made such a small batch, I used my Ball Home Canning Discovery Kit basket and my largest stock pot instead of my big canner. Since it was a smaller pot, the water came to a boil quickly. In fact, this whole project took about 15 minutes, including processing the cans. You could also easily slip this jar in with a batch of something else you are canning. I just just trying to preserve the plums before it was too late and didn't have any other canning projects ready to go. Some thoughts: If you have more plums, I think this recipe could be easily doubled. 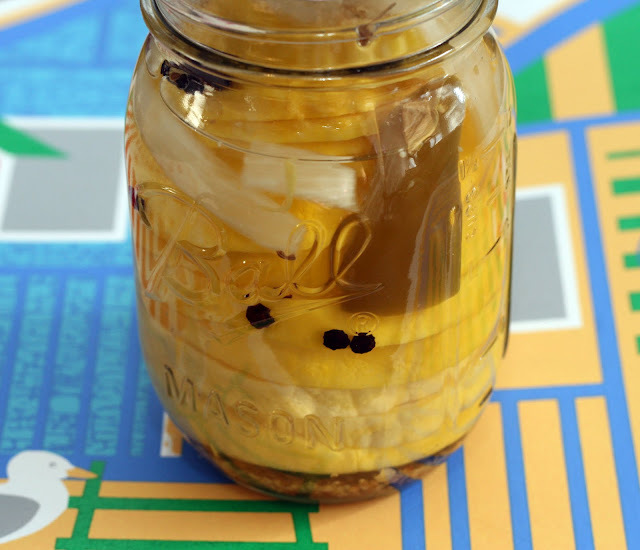 You could also use two wide-mouthed pint jars instead of one quart. I have a bunch of vintage quart jars my mom's friends have passed on to me and I like to use them when I can. 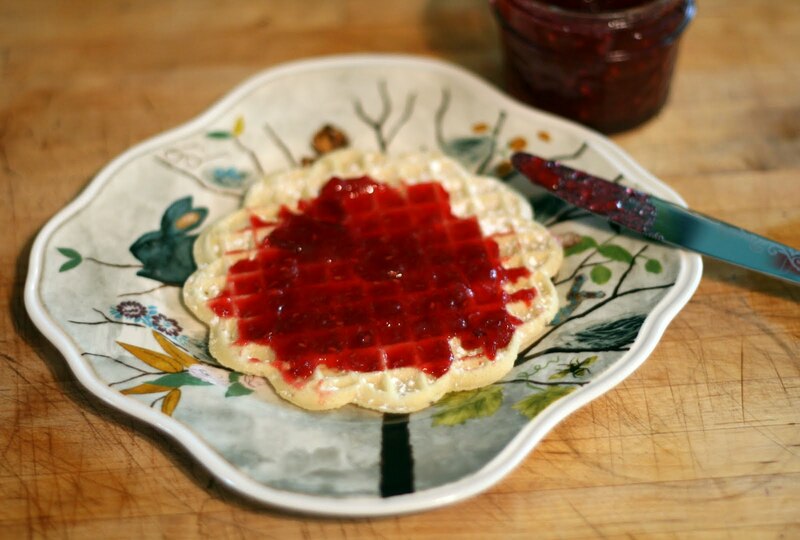 Use a potato masher to gently mash the raspberries. It should yield 1 cup crushed raspberries. 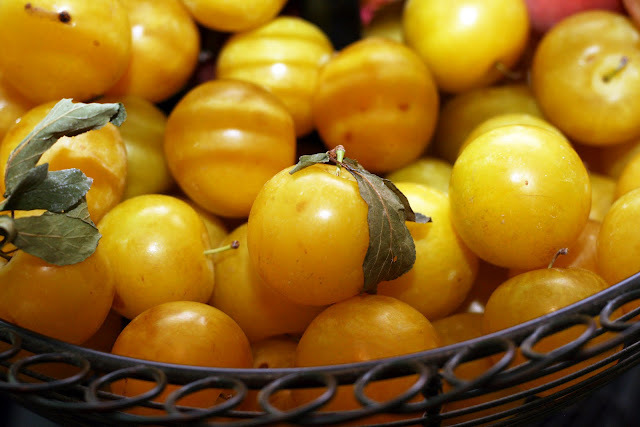 Repeat with the plums to yield 2 1/4 cups. Evenly sprinkle the bottom of the Ball Jam Maker with the pectin. Spoon the fruit in a relatively even layer over the pectin. Press the jam button. You will hear a beep at 4 minutes. Sprinkle the sugar over the fruit mixture while the machine is still running. Cover and let it do its thing until it beeps again. Press the cancel button and unplug the machine. 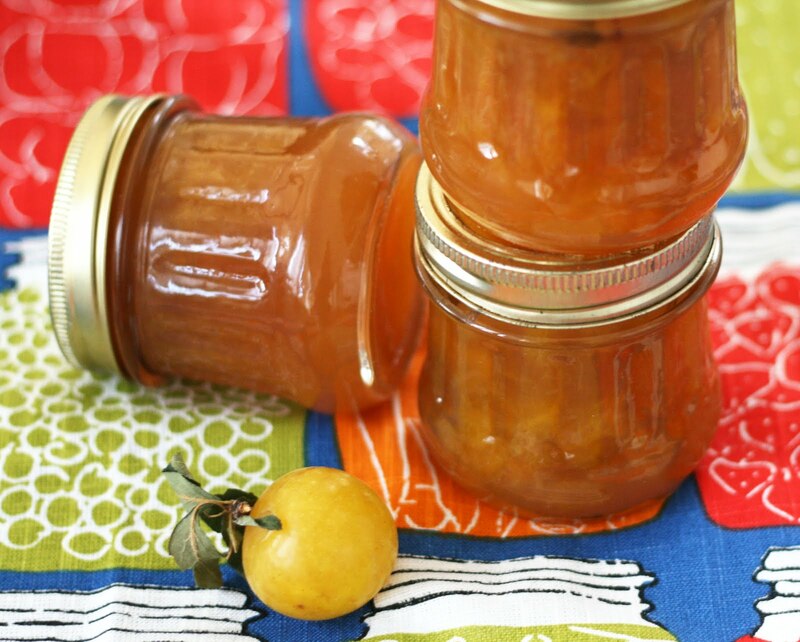 If not using a Ball Jam Maker, make the jam on the stovetop using the traditional method as seen in this recipe. *I recommend these jars of "flex" batch pectin. 3 tablespoons equals 1/2 of a pouch of boxed pectin. I recently aquired the new Ball Jam Maker and have been dying to try it out. I haven't been canning as much this year as last because it has been too hot or rainy to go berry or peach picking like we did last year. We had a bumper crop of raspberries and blackberries very early in the season but it was short-lived and I made other things with them. Anyway, all this means is that I've had this jam/jelly maker for a while now and it was just last week I finally got to try it out. I know making jam isn't the hardest things in the world (I've made plenty of it) but it does require me to be in the kitchen, over a hot stove during the hottest time of the year in our un-air-conditioned kitchen. Not the most fun even though I love the outcome. Enter the jam maker in 20 minutes or so (about the time it takes my enormous canning pot of water to boil) you get jam. From what I can tell, it is basically like a wide slow cooker with a paddle that stirs and cooks the jam without getting your kitchen hot. Or the need for you to watch it. It does make rather small batches of jam (4 8-oz jars or so) but you can clean it out and use it again in the same day of course and if you are like me and like to make a variety of flavors of jam, means you aren't overloaded with any one flavor. I went pretty simple this time since I hadn't used it before but I don't see why you couldn't add some other herbs or vinegar to the mix. I was pleased with the results. One of the issues I've had with plum jam was having too many big pieces of skin left (which I personally don't mind but other people have commented on) and this time there were few obvious pieces left in the final jam. I like the flavor of plum skin so I was glad I could leave on. The jam was also, as you might expect, very, very well mixed, not as "lumpy" as homemade jam can be. Place all ingredients in a medium bowl. Stir to combine. Refrigerate overnight for best flavor. Baltimore isn't exactly a pimento cheese stronghold but being a reader, I had read many books that mentioned it over the years and was intrigued. 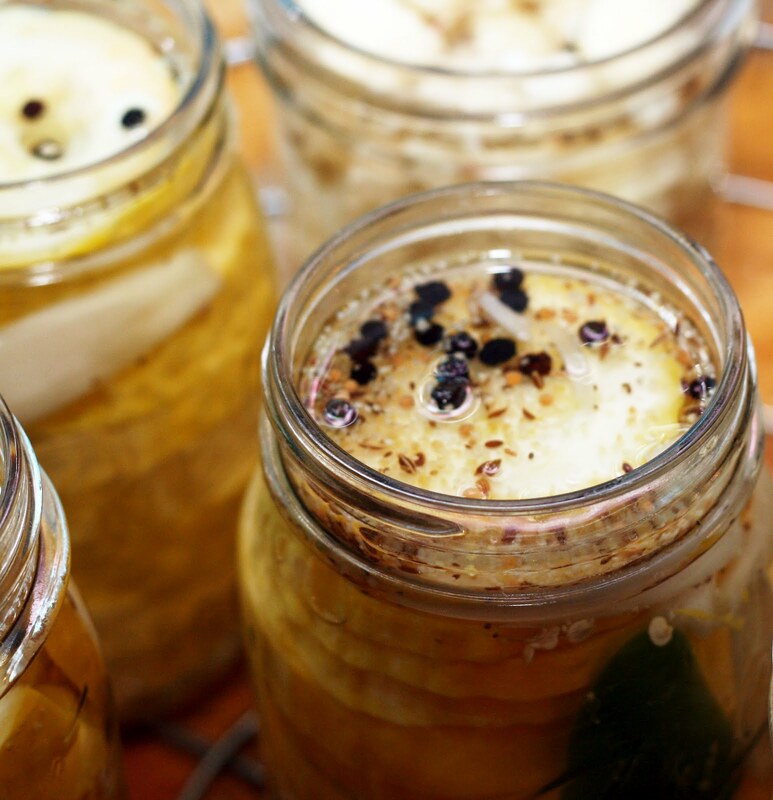 Occasionally, I've seen jars of it in the store but how could that compare to homemade? 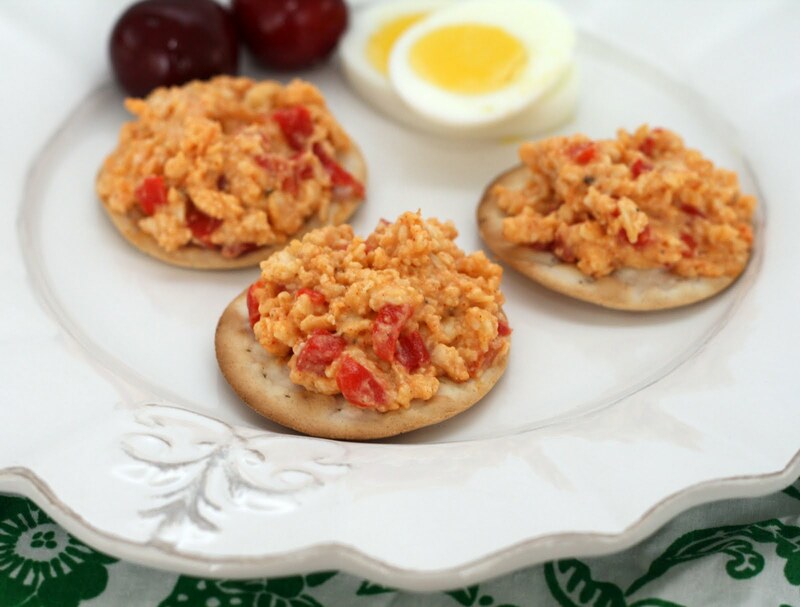 Alas, no one I know has, to my knowledge, made pimento cheese much less served it to me so I was on my own. I had made a version of it but it wasn't quite traditional. 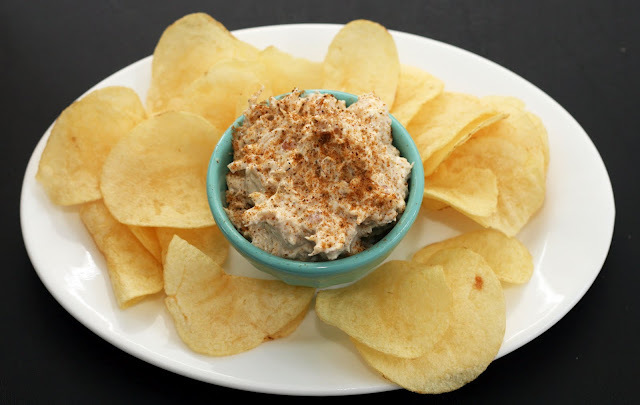 So when I was in Nashville in May I took that chance to have pimento cheese in situ. On our last day in Nashville, we had lunch at Picnic, where I had the salad plate which was pimento cheese, chicken salad, a muffin and carrot sticks. The perfect Southern ladies who lunch plate. It was as good as I expected so I thought I'd make my own. My cheddar is a little more aged than what they used (I used Cabot Private Stock Cheddar I bought at Costco which has a crumbly texture that works well in this dish) and I added a bit more bite with the mustard and paprika but the spirit is the same. Cool, picnic-like and oddly summery. Preheat oven to 350. Line a baking sheet with parchment paper. Toss all ingredients together until the okra is well coated. Arrange in a single layer on the pan and roast for 20 minutes or until crisp and lightly browned. I was faced with a lot of super fresh okra I had picked up at our local farm store and wanted to do something different with it. I hadn't roasted okra before so I thought I'd give it a shot. It was really good! 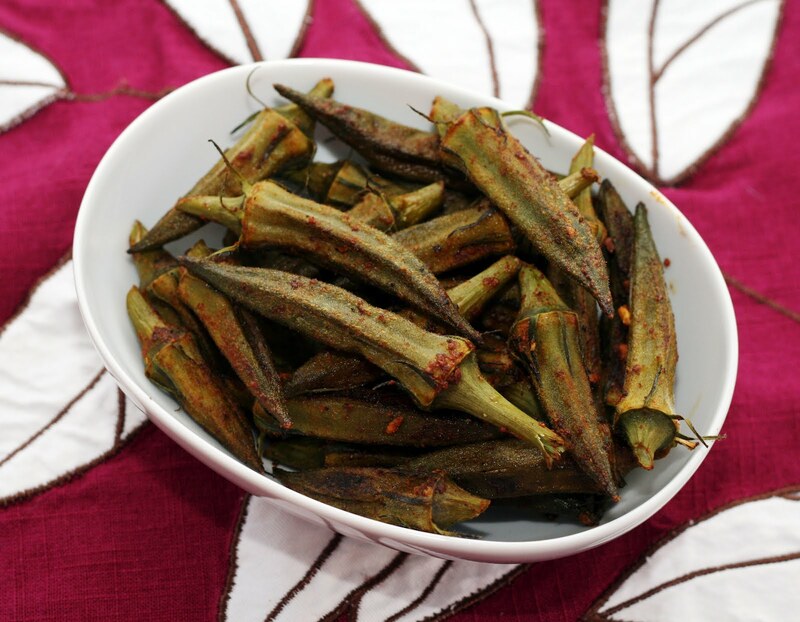 The spices stuck well and the okra came out very smooth, almost creamy; not oozy at all. Preheat oven to 425. Line a baking sheet with parchment paper. Set aside. Flour a clean, dry flat surface. In a large bowl, whisk together the dry ingredients. Add the yogurt and milk and stir until a smooth dough forms. 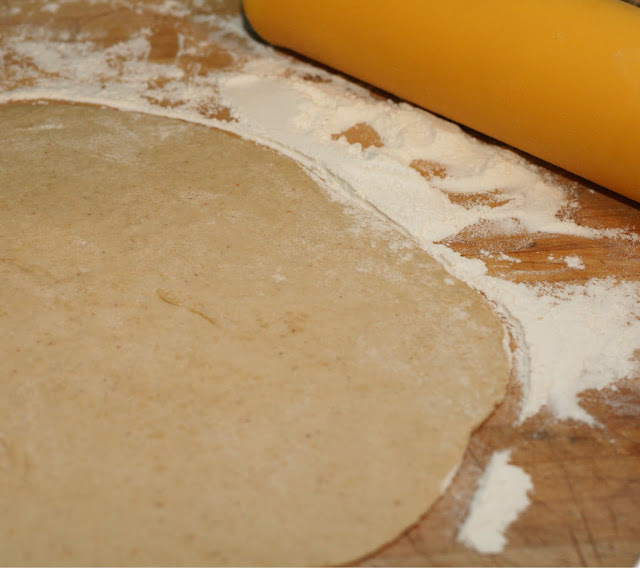 Place on the floured surface and using a floured rolling pin, roll the dough out to about 1 inch thick. Use a 2-3 inch biscuit cutter and cut out biscuits. Arrange 1/2 inch apart of the baking pan. Bake for 12-15 minutes or until golden brown. 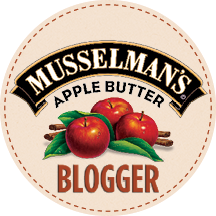 Melt about a tablespoon of butter to a skillet. Add the the sausage and cook, breaking up large chunks with the back of a spoon, until browned. Sprinkle with 1/4 cup flour and spices and cook 1 minute, stirring constantly. Stir in the milk. Cook, stirring continuously, until the the mixture thickens. Pour over biscuits. We've been feeling rather Southern around the Rappaport house this summer as you might have noticed. 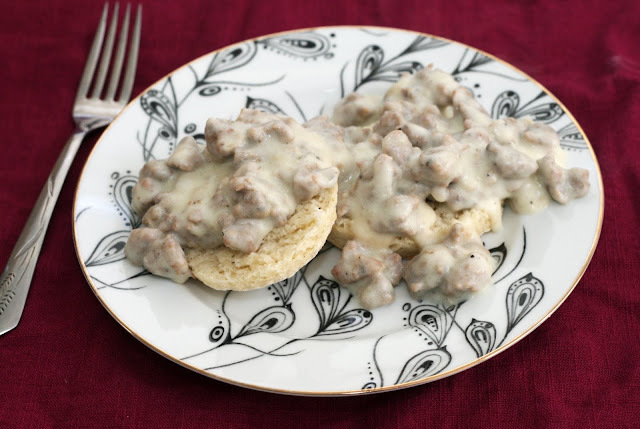 Sausage gravy over biscuits is south of the Mason-Dixon favorite but one that is definitely on the heavy side. I love it but honestly, made the traditional way, it always leaves me feeling a little queasy. It is just so heavy! Pork sausage, pork fat, butter or lard biscuits. Too much. So I decided to make my own version that I could eat and enjoy. It honestly tastes a lot like traditional sausage gravy so much so, I think you could pass it off as pork if you wanted to be sneaky. The trick is using flavorful turkey sausage as your base. Then I made very light, fluffy and moist biscuits using Greek yogurt instead of butter or lard. They were awesome and I can't wait to make them again. They were very fine textured (I even broke out my stash of White Lily flour for them) but substantial enough they didn't get super soggy when doused with gravy. Best of all, I felt great after eating them! 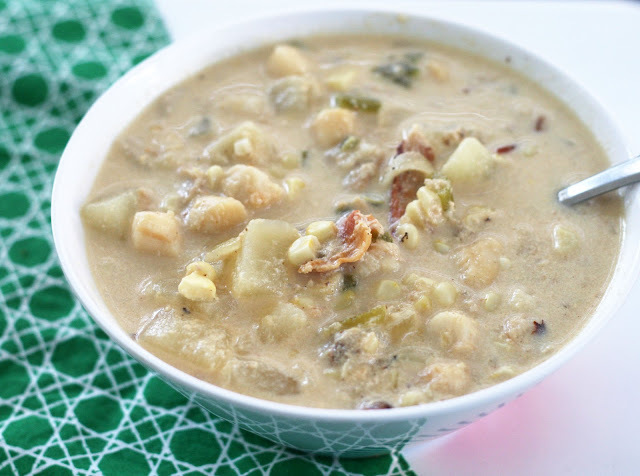 This really takes sausage gravy and biscuits from a "once a year" food to something you'd feel comfortable letting into more regular rotation. 1 lb cleaned squid "tubes"
Saute the eggplant, pepper, shallot and garlic in olive oil until the shallot is translucent and the eggplant is softened. Meanwhile, saute the onion in a Dutch oven until translucent then add the tomatoes and herbs and reduce heat to low. Remove the eggplant mixture from heat. Toss with breadcrumbs and capers. Allow the mixture to cool slightly. Fill each tube with eggplant. Do not overfill, the squid will shrink as it cooks. Pierce the squid with 1-2 toothpicks to seal. Place the squid in the sauce. Cover and cook 3-5 minutes or the squid starts to cook. 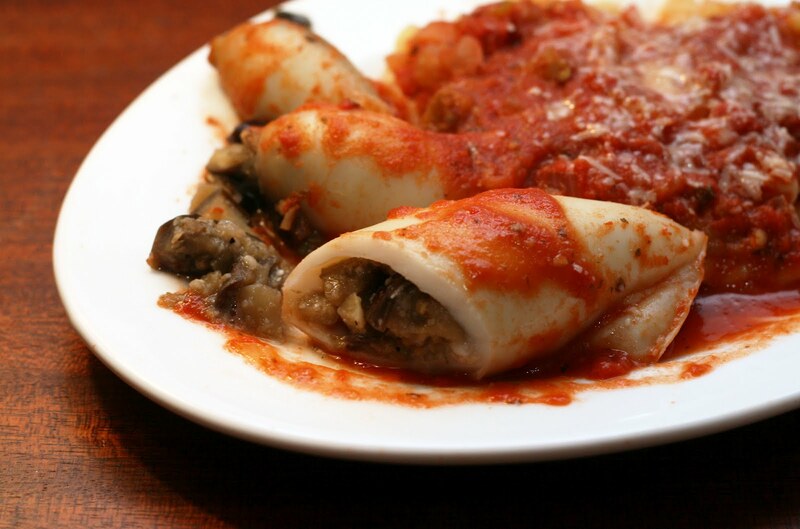 Remove the lid and continue cooking until the squid is fully cooked and the filling is hot. Serve with pasta. When I saw cleaned squid at the grocery store I knew I had to get it. I've been wanting to make stuffed calamari for years but the few times I've seen squid, it has been sold as a combo of tubes and tentacles and since the tentacles are heavier and seemingly more numerous than tubes, I'd have to spend a fortune to get enough squid tubes to stuff and then I'd have to make something with a couple of pounds of tentacles very shortly afterwards. This time the tubes and tentacles were sold separately. So I bought a pound of tubes (about 10? tubes)and then scrambled to think of something to fill them with. I had noticed eggplants when I first walked into the store and they looked really good so I went back and picked some up. I'm glad I did because I ended up making an Italian inspired dish and these in season eggplants were not only tasty but the perfect texture for stuffing the squid. The end result was wonderful. The squid wasn't chewy and the eggplant was velvety. I kept the tomato sauce simple and it didn't overpower the seafood at all. In a saucepan, bring the broth to a simmer. Heat oil and butter in a large saucepan Saute the shallot until translucent. Add the rice, salt and pepper and sauté for 2-3 minutes, stirring continually. Add the broth a 1/2 cup at a time, stirring continuously, and waiting until the liquid is absorbed before each addition. When you are about a third of the way through the broth, add the squash to the rice. Continue to add broth and stir. 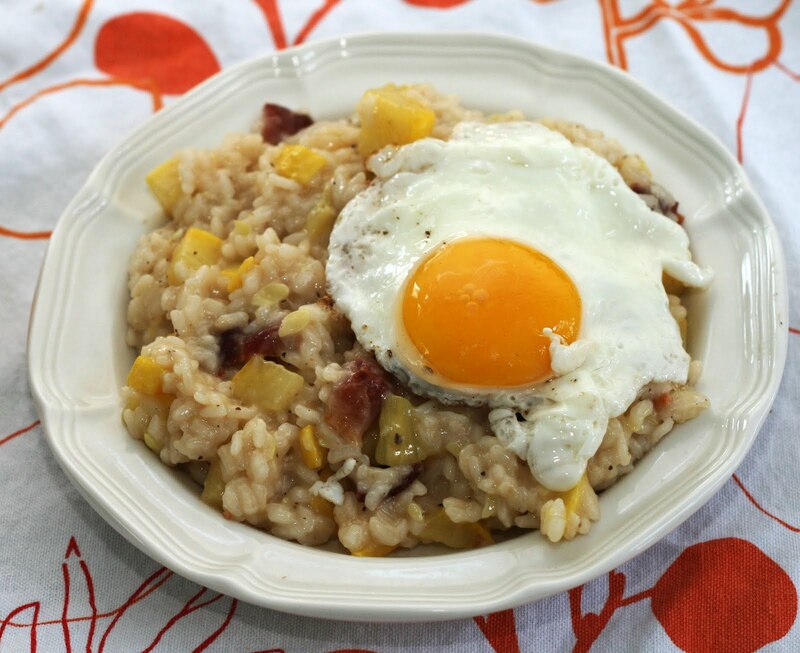 When the risotto is creamy and the rice is al dente remove from heat and stir in the Parmesan and bacon. Top with fried egg. We have really been having great luck with our squash. We didn't even know it was crookneck when we planted it (extra plants from my mom's neighbor) but we've been enjoying it. Normally grocery stores only carry zucchini or plain yellow squash (at least around here) so crookneck is a fun change. I think it tastes a little sweeter than regular summer squash, even when compared to homegrown zucchini of years past. 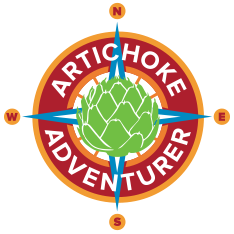 Of course, you could sub in yellow squash or zucchini if you don't have crookneck. The fried egg and bacon was just a fun idea I had. Sort of a dinner-breakfast crossover. Brinner? Note: I used an awesome knife from New Westknife Works to cut up all of these ingredients. It is so sharp and cuts like a dream. I have never made such quick work of a squash before. I can't wait to try it out on winter squash. They are beautiful as well. Right now they are hosting a giveaway for a knifeblock + knives. It is an amazing set. Contest ends August 13th. In a Dutch oven, cook the bacon. Drain off most of the rendered fat. Saute the onion, potato, garlic, jalapeno, and celery until the vegetables are softened. Add the pepper sherry, spices, milk, and evaporated milk. Simmer until the potatoes are nearly cooked. Add the crab and scallops and simmer until the scallops are fully cooked. When we were in Maine, we ate a lot of chowder. No clam chowder oddly (maybe it was out of season?) but lobster chowder, fish chowder, seafood chowder, shrimp chowder. They were all very good but I found that the chowders I liked the most had a lot of "stuff" in them. Most of the chowders we had were straight up fish and broth. Which again, were tasty but I liked the ones with a bit of vegetables and other seasonings as well. Not to mask the fresh seafood but to enhance it. I used some cute bay scallops and fresh blue crab meat. I was just going to go with the scallops but 1. I am a Baltimorean and think everything tastes better with crab and 2. I like how the crab pops up in more bites than the scallops do. I didn't want a spoonful to be seafood-free and scallops can be elusive, slippery things in soup.